Place the lamb cutlets on a plate and sprinkle over the thyme, rosemary and garlic cloves. Drizzle with Rapeseed Oil and set aside to marinate for at least 15 minutes. Meanwhile, cook the new potatoes in a pan of boiling water for 10-15 minutes, or until tender. Drain and cut into quarters, then place into a bowl and season with salt and drizzle with Wicklow Rapeseed Oil. Toss well to coat. Heat a griddle pan over a high heat and add the new potatoes. Toss the asparagus in the Rapeseed Oil, season and add to the griddle. Cook the potatoes and asparagus for 3-4 minutes, or until nicely charred and tender. Set aside. Heat some more Rapeseed Oil in a separate pan and fry the shallots with a pinch of salt for 3-4 minutes, or until softened. Add the spinach, nettles, wild garlic and a splash of water. Stir well and cook for 1-2 minutes, then add the purple sprouting broccoli florets. Pour the stock into the pan, followed by the cream. Stir well and cook for 3-4 minutes, until the liquid has reduced slightly in volume. Just before serving, stir through the butter until melted. Return the griddle pan to the heat and add the marinated lamb cutlets. Griddle for 2-3 minutes on both sides, or until golden-brown all over and cooked to your liking. 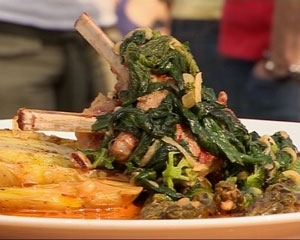 Divide the asparagus and potatoes between two serving plates and lay three lamb cutlets on top. Spoon the fricassee over the top and drizzle with a little Rapeseed Oil.